For anyone who’s always on the go, the Sprint LivePro device is the perfect tool to stay connected. 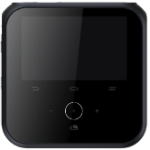 Manufactured by ZTE, this device serves a double purpose as a projector and a Wi-Fi hotspot. The LivePro features a 4-inch touchscreen display with an 800x480 resolution that users can easily enjoy using without the necessary background of having one in the past. The device runs Android 4.2 Jelly Bean OS and is powered by a 1.2GHz dual-core Qualcomm Snapdragon S4 processor backed by 1GB of RAM. There is an internal memory of 4GB built into the device with a microSD card slot that supports up to 64GB of memory expansion. Since the LivePro serves as a projector, it is able to project 10 inches to 10 feet of its display with a lamp brightness of 100 lumens and a lamp life of 20,000 hours. As a Wi-Fi hotspot device, it can connect up to 8 devices at the same time. With its 5000mAh battery, the LivePro is able to last up to 2.5 hours of projector use and up to 10 hours as a Wi-Fi hotspot.